On June 10, we passed the 5th anniversary of the worldwide release of DNF. I can't believe it's already been 5 years since the unshippable shipped. In that same amount of time for Duke 3D, we saw a few Duke spin-offs hit store shelves, a sequel announcement, two PC Gamer cover stories, endless plan file updates, and two engine switches. This list always kills me. The United States' entire program to put a man on the moon, from Kennedy's challenge to the landing. It took less time to figure out how to put people on the moon and bring them back. That's because Gabe blew it up. Dammit you beat me to it Tibbs! To think DNF has been released for 5 years. Thats over 1/3rd of DNF's development time. Something like Starcraft Ghost or Beyond Good and Evil 2 might have been known for longer, but Half-Life 3 is definitely the 'new DNF'. The difference though is that people at Valve aren't actively saying HL3 is still being worked on, and they've released other games, unlike 3DRealms who simply licensed out Duke. Me and my brother waited since the 90's to get our hands on DNF, and now the same for Half-Life 3; he doesn't even play games anymore but I know he'd make an exception for Half-Life. -The Hoover Dam was built in 5 years (1931-1936), although it took 9 years on top of that (starting in 1922) for the paperwork. -World War II and the entire Manhattan Project. Yes, even the complete development of the atomic bomb took less time. -The Beatles formed, released every single one of their albums and broke up. During this time they also toured the world several times. HL3 is not officially in production, so it can't be vapourware. We all know it exists in one form or another. Technically Episode 3 is vapourware because it was announced and even had a release date for Christmas 2008. It just never came. No notice, no information, no explanation of delays. It was just quietly put aside. Shows the effect of the motivation to get something finished. Time flies! I dig DNF, I think it's practically a miracle that it got released, here's hoping we see another PC Duke FPS sometime in the next decade or so. It's not a bad thing that it got released. At least for the fact that a lot of people worked very hard for a long time on it and they deserved their work to be released and out there. But it was an ok game at the same time. Not great but not awful. Plus we can all put it behind us now and don't have to perpetually wonder "what if?" George hadn't been such a terrible producer/director (whatever his title was). It's hilarious to see him criticizing the development of other games now. He LOVES to rail on Star Citizen, and I'm like: Dude, you have no right to comment. Anyway, I agree that DNF was not The Worst Game Ever™. I've been thinking about replaying it soon. It definitely fell short of what we were looking for though. 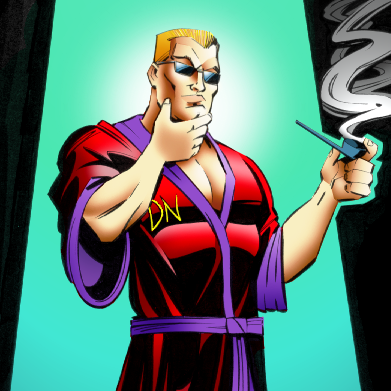 One thing I'm very glad about the current version of DNF is that even though it's not the Duke gameplay we all wanted, at least it was still a Duke Nukem game identity wise. In this day & age where games are forgetting themselves and being something they're not like the badass dino killing Tomb Raider turning into a boring gritty survival story and the stupid pissed off God killing God of War turning into a relationship between a bearded guy and a kid(Last of Us Rip off much?). DNF actually kept it's identity, my favorite part of the whole game is the personality, from the effort that went into the detail & personality of the levels. Not to mention DNFs levels were very interactive, a big part of DN3D. I still replay the game every now and then just to admire the Duke persona put into the game, the Duke Burger level being my favorite, not just because I get to fight aliens while being the size of a rat, but everything in the level has the Duke personality all over it, from the cardboard boxes in the stock room to the condiment jars having Duke's face and humor on them. You can tell how much love and care went into the game despite it not coming out as good. I saw this review back shortly after the game came out and still agree with it too this day. 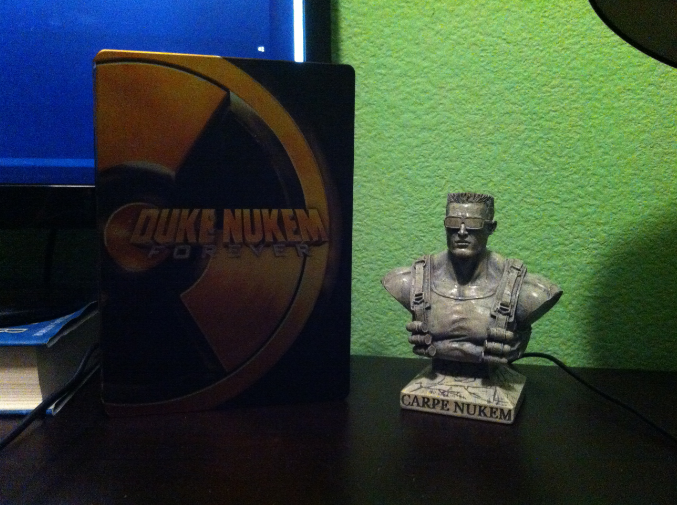 Duke Nukem Forever will always be my favorite video game guilty pleasure. 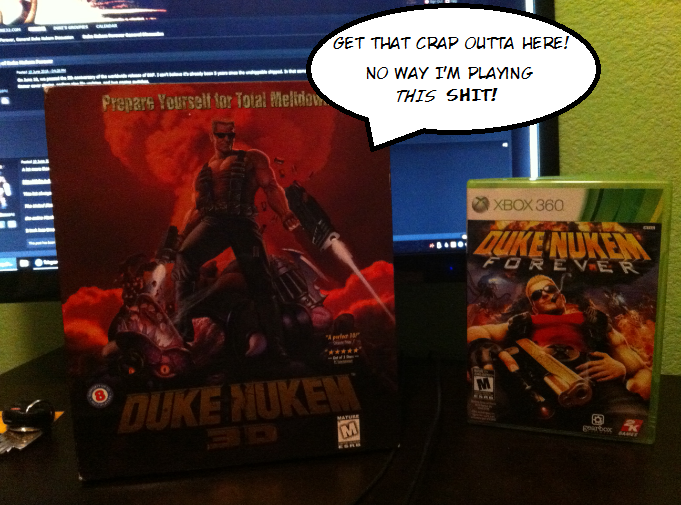 There's parts that ooze Duke Nukem and parts that are full on Douche Nukem in DNF. In the second half of the game, he almost becomes a mute also (besides one liners from killing an alien) which is odd considering that's exactly what happens in Prey, too. I remember Duke showing his personality in DNF in being scolded by cliche president and denied his throne by random dipshit. While Duke Nukem 3d was mostly homage with a right amount of fun and silliness, DNF became self-parody and pop culture reference list. I enjoyed it and still do. I agree with xmobilemux, I liked the game and had fun! I still play it from time to time. Duke burger is by far the best level IMHO, but there are others that I love to load up. I enjoyed the DLC a lot more, actually. Can't believe I missed this. A big happy birthday to the big disappointment itself! You know, when all's said and done, the one thing that still bothers me about DNF is that garbage box art. Makes me very grateful I have this steel case. Quite honestly, I don't know why anyone still holds out hope for Half-Life 3. Valve has been trolling its fans for over a decade now. If Valve were going to release it, they'd have done so already. Gabe Newell is richer than God. Why would he risk his vast fortune for a game that will have so much hype it will never be able to live up to? How Valve trolled its fans? After several years they have been pretty moot about HL3 with everyone else making jokes about HL3. People troll themselves. Granted I still have hopes for a new Half-Life game coming into existence someday. Valve is raking in easy money with Steam, but I could see them wanting to put out at least one more legit single-player epic. That was the funniest one. Gabe gets a pass for that one. CS:GO and DOTA 2 are both developed by Valve and both bring in insanes amount of money. The current prize pool for The International 2016 for DOTA 2 is sitting on just over 18 million dollars. Why wouldn't you keep working on that? Topics are a starting point. The natural flow of discussion tends to have bends where something else is brought up that ties in somehow that sends the discussion in a different direction.